Access students at 1,000 schools instantly! Campus rep programs are only as successful as the students participating. Don’t waste your time, energy, and money on something that doesn’t work. 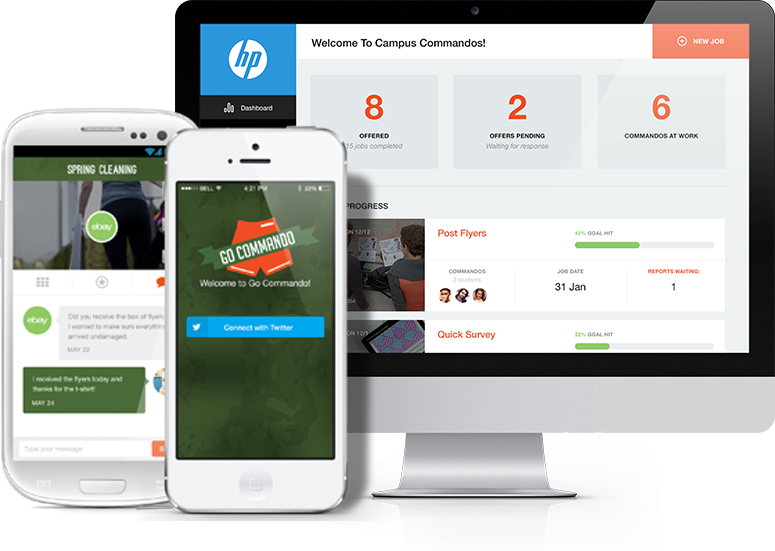 Go Commando App can transform your presence and engagement with students on college campuses. How? Instant reach to students at more than 1,000 colleges and universities nationwide. – Thousands of potential student brand ambassadors ready to spread your message! Pre-screened campus reps cut out the waiting period. Create a task, set the cost, and we’ll take care of the rest. Fast, accurate, accountable campus reps. Track students’ progress through in-app location, photo or video, and chat functions. No cost until task is completed to satisfaction, approved by you. If it isn’t done right, you don’t pay a cent. Period. Quick social media marketing and engagement return. Our reps don’t just represent you in person, they represent your digital brand, too. Interested in seeing some real data? Check out our downloadable infographic.